As above, what breeds would you consider if you were keen on obedience/agility? My focuses are on structure and temperament so that I have a dog that is physically sound and capable and enjoys training. I'm not so focused on being uber-competitive, but we are out there to make a go of it of course. What breeds would you consider and why? And if you have had a lot of experience in the obedience/agility ring - what breeds have you seen doing well and enjoying themselves? Feel free to add in any breed not just small ones if you really want to. if i were picking for myself, i'd pick a jrt right now. but i tend to prefer the bold, bossy, drivey, opinionated dogs. alternately, a miniature poodle. which is on the other side of the universe, perhaps, but they're super smart and love to play games. I would pick a crestie for a small breed. I'd like to get into agility with my Collie/Aussie mix as she is VERY agile, fast, intelligent, and spunky. So if I were to pick a breed for myself, it'd probably be an Aussie. Of course, I'd be more worried about how the dog would mesh with my home life than about how it would do on the course. I really like the JRT, BUT I don't think I would suit them as an owner. For all the reasons you stated, elegy and I'm not the most experienced trainer. Love the mini poodle actually, my favourite poodle in terms of size and - from what I have read - temperament/personality. Of course it is more important to have a dog that fits into your lifestyle, my dogs are always companions first. But I love discussing breed attributes. I've never considered a Crestie before. I learn some more about them. A Basset Hound! LOL, you just gotta work to their strengths, really work on that accuracy! 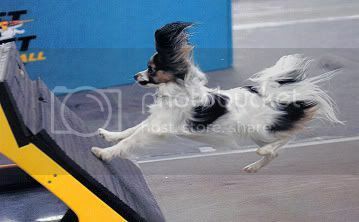 Papillon would be my top choice for a small breed competitor. Other than that, I'm sticking with my Aussies. definately a mini aussie, I wouldn't want to go smaller for myself. I gotta put in my vote for corgis. Smart, eager, energetic, easily food motivated. Sometimes a bit too smart. Creative. A little bit of a terrierish streak to them. But really, as you said, "it is more important to have a dog that fits into your lifestyle". I've seen amazing performance done by breeds you would least expect it from. If the dog suits you - personality, training, lifestyle - then go for it. IME, it really comes down to the individual dog a lot more than breed as far as what will make for a good competition dog. And even then, it's still going to vary depending on what the owner brings to the team and what your goals are. I would say decide what traits you want to live with and go find something suitable for you that is healthy and structurally capable of staying sound - preferably with energy and drive and an off switch. for me if i was looking for that it would be a crestie, pappillion or a mini poodle. all 3 breeds would suit! cresties have speed, infact i ran my male crestie against a whippet ar a local "for fun" lure event an he matched the whippet stride for stride turn for turn untill the very end, the whippet beat him by a nose! like a sighthoun though be prepared to train very well on recalls and realy get to know a crestie well they have a tendency to want to do it their way, they also try to figure out a "better" way of oing things, however they do love their people and love to please so a well raised socilized crestie generally does very well at agility obedience even weight pull! they are VERY sensitive though. and poodles of course are smart and athletic too! My choice would be..... Izzie! My Pug! Lol, it takes a very special Pug to do agility apparently. Alternatively a Papillon... They're fast little spunksters. What about a Min Pin? My local agility club type place has "bulldog night" every week...not just for bulldogs, but any overweight, elderly, or "slow" breed can come, they lower the equipment and have a great time. Probably a poodle. I love papillions, but I'd rescue and personally poodles are easier to find in rescue. A JRT is a good, fun, option for performance but they can be a handful. are all dogs I'd look into for competitive agility/obedience work. As far as a dog that's a pet first, agility for fun, kind of deal, I'd widen the search to include probably westies, other small terriers, and boston terriers, Pomeranian, etc. I know a couple of shih tzus that i bet would do great in agility. Chihuahuas are actually very good at obedience and very "trainable." The trouble is if you're doing competetive obedience, their heelwork doesn't usually look as good as other breeds because it's harder to see if they're in the perfect position. And if you want them to stare up at you the whole time, they will get a crick in their neck. They love jumping and climbing so they're well suited for agility, but some of the obsticles (weave poles, a-frame) are difficult to train for such small dogs. And of course, you'll have to make sure they have sound knees. Personally, I'd go with a bichon. They've been used in circuses since the 1800s, so they're definately very good at tricks and training. They're a good size, not super small but still defintely a toy breed. If you wanted something a little bigger, corgis and mini aussies are good. With corgis you'll have to find a good breeder that cares about back issues if you're going to do agility; but a well-bred corgi should have no problem with agility. Good mini aussie breeders are hard to find, so I wouldn't suggest them to just anyone; but if you know how to find a good breeder and won't settle for less, that's a fun option. ETA: OMG I can't believe I forgot about shelties! I almost got a sheltie a few years ago because I needed a good, small, agility/obedience dog, and there are few better than shelties. In the end I didn't get one because I couldn't take the barking. If I was going with a purebred, Cavalier. I am friends with some excellent breeders, and they are taking over the agility world with their dogs right now. The breed never once appealed to me until I met them - such charmers! And out performing the Jacks and the paps (both of which are amazing in their own rights). But I've been thinking lately that a small dog may be where I go next for a pet/agility dog. And for me, it will likely be a rescue something or other. There are a ton of small, super active, athletic, cute young dogs I've seen lately in rescue. My friend's rescue gets dogs in from Puerto Rico on occasion, and they are just what I'd want in a small dog. Hey, Pops, what about a Feist? Papillon, most definitely. 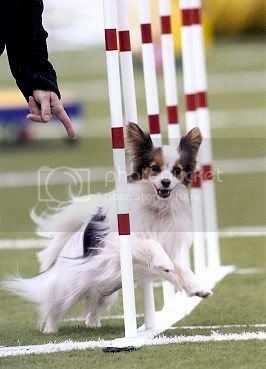 A good papillon will have a loooot of drive and energy for a small dog. They are not called the border collie of the toy group for nothing. VERY highly intelligent, biddable, and athletic. Some are a bit soft but if you go in and look for a sports dog you will end up with a Mia. I often think Mia has way more potential than I do. I don't know if I could take her as far as she could go. 2nd choice would be a sheltie but honestly having had both, my paps are easier to train and drivier than any of my shelties have been. I will say the paps seem to be a little er.... more creative in their thinking. The paps do have a very free thinking, almost impish aspect of their temperament. They're definitely not blindly biddable dogs at all. But they'll work for you most the time. if they wanted to go hunting i'd heartily reccommend a feist or a feistXcur. but for the whole sport thing that would be a waste of a good hunting dog. now if she were specifically looking for a feist i'd give her the contact info for a few breeders. Why is it a waste? Kat could be a great hunting JRT (she is certainly bred for it!) 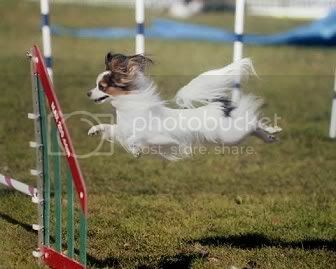 and a fantastic agility/sport dog.. the two are not mutually exclusive. Paps are a great choice. And a well bred JRT is NOT a really difficult dog. Esp if you are planning on getting into dog sports. A JRT with a job and training is a delightful beast. JRT would be my third choice. Forgot to add that lol.